The adage holds true: If you take care of your equipment, it’ll take care of you. To help extend the life of your portable diesel air compressors, it is important to follow a preestablished maintenance routine to care for your machine. Ignoring this may result in your machine unexpectedly breaking down or an overall shorter lifespan — something no business or rental house can afford. While there are many factors affecting the routine maintenance schedules of portable diesel air compressors — such as climate, operating conditions, the specific machine and engine manufacturer — there are routine maintenance procedures that apply to nearly all compressors. Checking all oil and fluid levels in the engine and compressor. Adding oil and/or fluids if necessary. Filling the fuel tank and draining any water from the fuel/water separator. Checking the dust collectors and cleaning if necessary. Checking and cleaning the coolers if working in dirty environments like media blasting and farming. In addition to daily checks and maintenance, the first inspection after 50 hours is important for the machine, which is also a “break-in inspection” to eliminate contaminants from the machine. Please refer to the manufacturer’s user manual for proper inspection and maintenance. It is also important to inspect radiators and coolers every 100 hours to ensure the engine and compressors stay at the recommended temperatures. Dirty or clogged up coolers and radiators are the most common reason for a machine to overheat and shut down. Be sure to also check for compressor oil quality using the provided sight glass. This is especially important in high humidity conditions and when the compressor has been running on idle for a long period of time under moderate temperatures. The most common wear parts in portable air compressors are filters and engine belts. In addition to air and oil filters, change the engine and compressor oil according to manufacturer recommendations, just as you would on your car or pickup truck. One simple standard practice to follow includes always maintaining a ready stock of replacement parts to avoid downtime, allowing you to complete maintenance in a timely manner. Some manufacturers offer service and maintenance kits at 50-, 250-, 500- and 1,500-hour intervals to help with maintaining a ready stock of replacement parts and filters necessary for these recommended service intervals. These kits are specifically created with end-users in mind to take the guesswork out of maintenance parts. Use the slow time (e.g., winter months) to perform these preventive maintenance activities and get your fleet ready for the busy construction season. If you notice your compressor is experiencing an issue such as low or no voltage, the engine running a high operating temperature, poor air delivery or it won’t start altogether, perform a detailed visual inspection to prevent additional damage or abnormal operation. It’s always best to consult your user manual, but also perform a machine walk-around and check for some common culprits. These include loose wires or connections, damaged piping, heat damage to parts, which can appear as discolorations or the presence of a burnt odor, low fluids, low or no fuel or loose or broken belts. Do not use the emergency stop button to stop the machine, except in true emergencies where immediate shutdown is required. Follow proper shutdown procedures, including closing the service valves and running the compressor for approximately five minutes to allow the machine to cool down. Then toggle the engine switch to off. During the winter, ensure the compressor control air lines are free of any condensate to avoid freezing while storing the machine during cooler months. For operators using rented equipment, you’re not off the hook for maintenance. Like equipment owners, renters are responsible for maintenance while using the equipment to ensure optimal machine performance. Operators are responsible for checks and maintenance of all fluids, engine oil, compressor oil, radiator fluid and diesel exhaust fluid as applicable. Depending on the environment in which the compressor is used, renters may also need to check the coolers frequently. If operating in a dirty environment — such as media blasting and agricultural applications — coolers need to be washed and cleaned daily. One example is in cotton farming. With blowing air, the cotton seeds typically get into the filter, clog it and then the compressor may overheat and shut down. Regularly checking the coolers will save many headaches and prevent unexpected downtime. 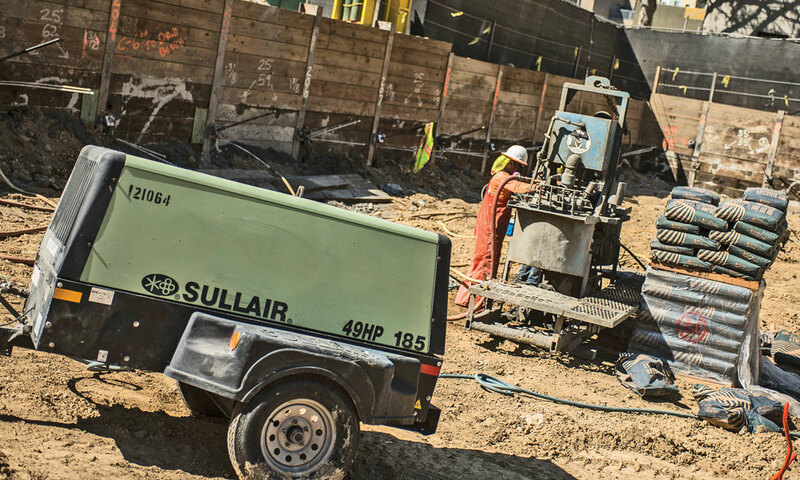 While portable air compressors continue to operate on a preventive maintenance schedule, technology is shifting this pattern. Operators will soon shift to predictive maintenance over preventive maintenance. In other words, users will know when something is going wrong and will have an opportunity to fix it prior to more damage occurring. One example of a low technology predictive maintenance feature already built into Tier 4 Final portable air compressors is incorporated into air filters. The air filters include mechanical air filter maintenance indicators, and aftercooler filters now include mechanical filter status indicator lights which turn red when they need to be replaced. This tells operators when it’s time to change the filter, making it likely the service will be completed on schedule. As telematics and technology continue to grow, expect manufacturers to continue to find even more ways to preemptively maintain portable air. Navendu Sharma is a senior product manager of rental and infrastructure at Sullair.